I want to share some new updates about my modified IoT data logger Phant. On can access the updates from data.modernblackhand.com . For original version developed by Sparkfun goes to data.sparkfun.com. The new version allows anyone to view my public stream by clicking “EXPLORE” in above image. There you’ll see a list of public streams. 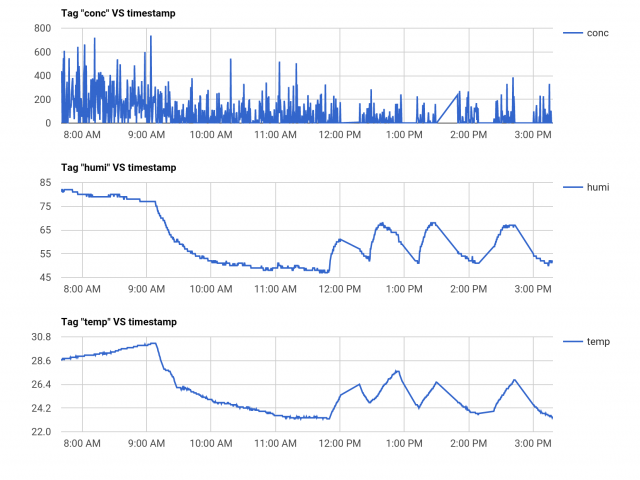 Click on it and (wait for a few seconds) it will display recorded data vs time using Google Chart. My wireless weather station prototype. 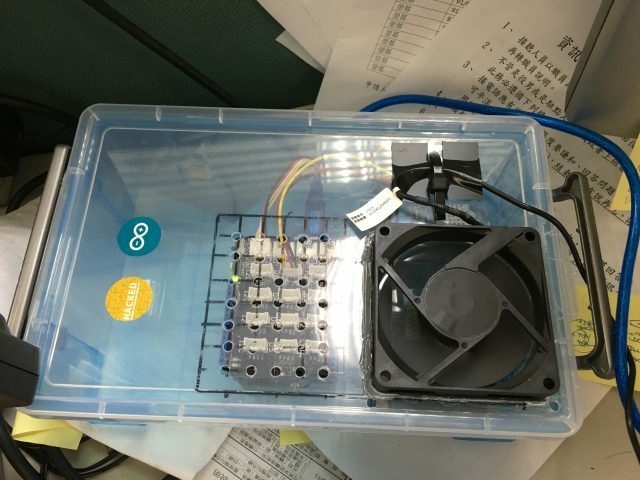 Left in the box is Arduino Uno + Wifi shield (old version) + Seeed Studio Grove shield. Right is a usb PC fan. Below it are one environmental sensor and one particle sensor from Seed Studio. Office weather data. First plot is particle index, second is humidity, and last is temperature. The first element “conc” represents air particle index. The second element “humi” is humidity (%), and the last one “temp” represents temperature (C). Data is recorded from 8am to 3pm for every 20 seconds. Date today is sunny/cloudy. Till 9am air conditioning is not yet on. One sees that as the sun goes up temperature slowly rises while humidity drops. After 9am air conditioning is on. One sees that due to the air moisture removal feature, now both temperature and humidity go down together. One sees that the room setup and the sir conditioning power makes it hard to go below 23C. After 12pm set temperature rises to 25 C. One sees that the air conditioning control tries to set the temperature around that point. It roughly fluctuates between 24 C and 26C, showing that the air conditioning control measures temperature at every 1C.